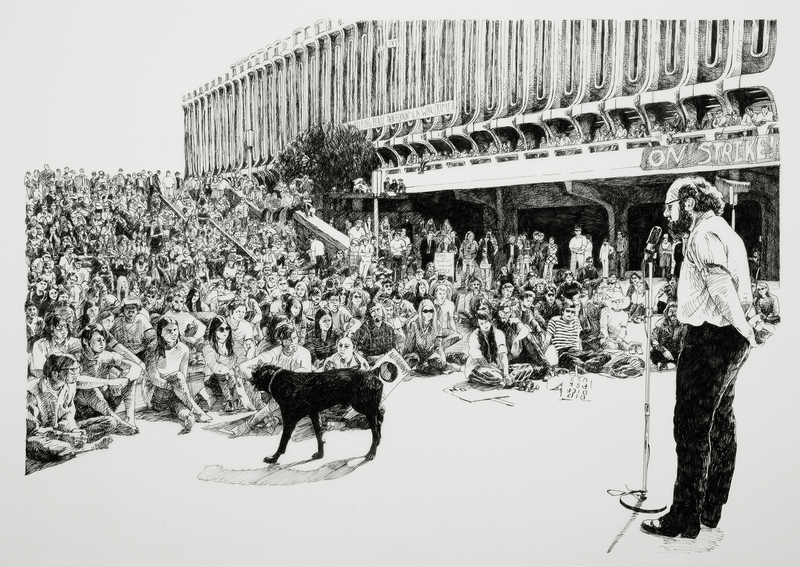 In this image, controversial UCI English Professor Steve Shapiro addresses a rally calling for a campus strike shortly after the secret U.S. invasion of Cambodia and Laos. During the two weeks following the Kent State shootings, over 400 colleges and universities nationwide went on strike. UC Irvine students, faculty, and staff engaged in strikes and other forms of collective action to protest U.S. involvement in Vietnam and the Kent State massacre, and to seek alternative forms of education. May 6, California Governor Ronald Reagan ordered the state’s universities and colleges shut down for four days in response to the protests.